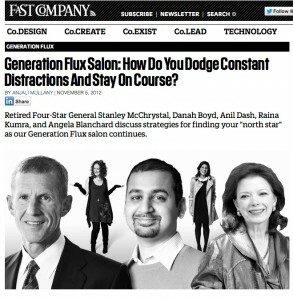 There’s a new series of pro­files on Fast Com­pa­ny that ties neat­ly to (and expands upon) the theme of my post on next gen­er­a­tion work­ers. As I read Robert Safian’s pro­file of Mark Park­er at Nike or Troy Carter at Atom Fac­to­ry — or the insights pro­vid­ed by Anjali Mul­lany while dis­cussing the ques­tion “How Does Tech­nol­o­gy Make It Hard­er To Lead, And How Does It Make It Eas­i­er?”, I enjoyed see­ing the basic con­cepts of nextsens­ing brought to life. In sum, Fast Company’s “Gen­er­a­tion Flux Salon” is, if you will, an atlas of companies/locations where nextsens­ing seems to be a way of doing busi­ness. There’s some great infor­ma­tion here. Yet, it would be wrong to con­clude that nextsens­ing is restrict­ed to those of a par­tic­u­lar gen­er­a­tion. Younger or old­er, the way the world is mov­ing requires that those deter­mined to keep their com­pa­nies vital must have the right mind­set, toolset and skillset. And that’s one of the major goals of this project and weblog: to explore, study and share news about nextsens­ing.